There have been some exciting new developments in the domain of health care policy as it pertains to speech-language pathologists (SLPs). For a long time, we as speech pathologists have known that our work encompasses treating disorders of feeding, swallowing, speech, and language. I personally have always agreed with the American Speech and Hearing Association (ASHA) (http://www.asha.org/slp/clinical/Cognitive-Communication/) that cognitive communication disorders are within the scope of practice for SLPs. In my opinion, since language is so tightly linked to cognition (cognition is, after all, often linguistically mediated!) it seems obvious to me that treatment for cognitive communication disorders and impairments would be within the scope of practice for a speech pathologist. Unfortunately, certain insurance entities have refused to recognize cognitive communication disorders as an area to be treated by SLPs. In this regard, there has been controversy over a speech therapist’s scope of practice, particularly concerning services that insurance companies are willing to cover. Although the new NUCC terminology is not identical to that of Medicare and other health plans, it is, according to the above-mentioned article, “the only code set that can be used for HIPAA-covered transactions.” Hopefully, this will help to broaden the scope of treatment that will be covered by insurance companies. I have often been asked this question by parents, and even educators. It is important for parents and professionals to know the differences between speech-language therapy and tutoring in order to make informed decisions about the services they retain or recommend for their children and students. While both speech-language therapy and tutoring can involve academic subjects and homework, the goals of speech-language therapy and tutoring are very different, as are the manners in which curricular materials are used. The goal of tutoring is to help students succeed with academic subjects and complete homework. Candidates for tutoring are those who need additional explanation of the curriculum presented in class, not necessarily because of an underlying language problem or learning disability, but because further elaboration or clarification of the material is required. Imagine a student in high school who is succeeding in every class except for chemistry. The student does not have a language impairment or learning disability, but needs additional explanation of the material in order to understand it, because chemistry in particular is a particularly difficult subject for this student. Tutoring sessions will most likely be devoted to helping the student understand the materials and complete homework. Given effective tutoring, this student will most likely succeed in chemistry, now that the subject has been better explained. Speech and language therapy, on the other hand, targets the linguistic and/or cognitive weaknesses or vulnerabilities of a student, in order for the student to be able to access curricular material. Rather than focusing on helping the student to complete homework assignments, the goal is to build and strengthen skills that the student needs in order to understand and complete the assignments. For example, let’s say that a student has a receptive language impairment (difficulty understanding and/or processing language). Many subskills are involved in language comprehension and processing. A speech language therapist would investigate the areas that contribute to the impairment, and provide the student with direct, targeted instruction and practice using strategies in order to improve upon specific linguistic areas of need. Curricular materials often are used in order to target speech or language skills, but the goal of using these materials is to help the child practice using strategies to improve speech and language in a functional context; therefore, although the homework assignments may well be completed, this is not the ultimate goal of a speech-language therapist. The goal is to improve the student’s language skills so the student will be able to independently understand and complete assignments across all classes or subjects. Another important difference between tutoring and speech-language therapy is that the latter targets goal areas outside of the academic arena. Language permeates all aspects of life, and so language therapy is also devoted to improving language skills not only to help children succeed in school, but to to help improve communication skills in the context of daily life situations. Both tutoring and speech-language therapy are valuable services, but they have different goals. It is important to keep this information in mind when determining whether to obtain tutoring or speech-language therapy services for your child. If you or a loved one have suffered a stroke, traumatic brain injury, or other neurological condition, and have noticed speech and/or language changes, the resources below may provide some helpful information. Aphasia is a condition in which a person’s ability to comprehend or produce language is impaired, often as a result of a stroke, brain injury, or other type of neurological damage that impacts the areas of the brain associated with language. See the links below to learn more about this condition. Apraxia is a condition in which a person’s ability to plan motor sequences is affected. There are several kinds of apraxia, though speech therapists can address both oral and verbal apraxia. Oral apraxia involves difficulty sequencing motor plans for any kind of oral movement (e.g., smiling, blowing out a candle) and verbal apraxia refers to problems with motor planning, specifically with regard to speech sound production for speaking, such sequencing syllables in words, or even sequencing movements to produce a sound in isolation. The resources below provide helpful information about apraxia. According to the American Speech and Hearing Association, a cognitive communication disorders “encompass difficulty with any aspect of communication that is affected by disruption of cognition. Communication may be verbal or nonverbal and includes listening, speaking, gesturing, reading, and writing in all domains of language. Cognition includes cognitive processes and systems (e.g., attention, perception, memory, organization, executive function). Areas of function affected by cognitive impairments include behavioral self-regulation, social interaction, activities of daily living, learning and academic performance, and vocational performance.” (http://www.asha.org/policy/PS2005-00110/#sthash.J40zbPc7.dpuf). Cognitive communication disorders could result from stroke, or traumatic brain injury. See the resources below for more information about cognitive communication disorders. According to the Stuttering Foundation, “Stuttering is a communication disorder in which the flow of speech is broken by repetitions (li-li-like this), prolongations (lllllike this), or abnormal stoppages (no sound) of sounds and syllables. There may also be unusual facial and body movements associated with the effort to speak.” For more information about stuttering, see the links below. If you think you or a loved one may present with any of these conditions, please do not hesitate to contact me for a consultation, as I may be able to help. If your child has been diagnosed with a speech and/or language impairment, or you suspect that this may be the case, the resources below may be of interest to you. The American Speech and Hearing Association defines Childhood Apraxia of Speech (CAS) as follows: “Childhood apraxia of speech (CAS) is a motor speech disorder. Children with CAS have problems saying sounds, syllables, and words. This is not because of muscle weakness or paralysis. The brain has problems planning to move the body parts (e.g., lips, jaw, tongue) needed for speech. The child knows what he or she wants to say, but his/her brain has difficulty coordinating the muscle movements necessary to say those words.” (http://www.asha.org/public/speech/disorders/childhoodapraxia/#sthash.0uDCNici.dpuf) See the links below to learn more about this condition. The American Speech and Hearing Association defines speech sound disorders as follows: “Most children make some mistakes as they learn to say new words. 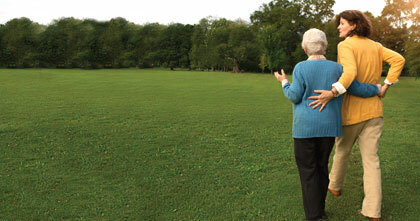 A speech sound disorder occurs when mistakes continue past a certain age. Every sound has a different range of ages when the child should make the sound correctly. Speech sound disorders include problems with articulation (making sounds) and phonological processes (sound patterns).” (http://www.asha.org/public/speech/disorders/speechsounddisorders/#sthash.WVpzoC19.dpuf) See the link below to learn more about Speech Sound Disorders. Some children present with developmental language impairments that impact their abilities to understand and/or produce language. When a child has difficulty understanding language, he/she is said to have a “receptive” language impairment, and when a child has difficulty with using language to communicate, the child is said to have “expressive” language impairment. A child might present with difficulty in one or both of these areas. The linguistic areas that may be impacted in a child with a language impairment include semantics (word meaning), syntax (sentence structure), morphology (parts of words that influence meaning), pragmatics (use of language in social skills), phonology (sound structure of language, as it applies to both spoken and written language), and linguistic executive functioning skills (including planning, sequencing, and organization skills). See the links below for more information. If your child has been diagnosed with any of these conditions, or if you suspect that your child may have a speech or language impairment, please do not hesitate to contact me for a consultation, as I may be able to help. "You have given me tools that I will use for the rest of my life." 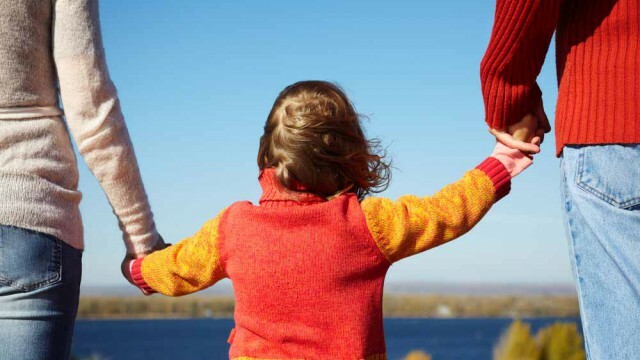 Alisa Bernstein was recommended to me by a highly-regarded education consultant and we couldn't have been happier or more impressed with the testing and results she provided to us after working with my son. Alisa was kind and patient with my very shy son, and she quickly won him over - to the point where he was begging to stay after testing was completed. Alisa helped boost her confidence to a whole new level! My 5 year old daughter began receiving speech-language services with Alisa after being diagnosed with a reading disability. After just four weeks of biweekly sessions, my daughter came out of her session proudly demonstrating how to read a brand new list of words. When she finished, she exclaimed “I can read!” Alisa not only gave my daughter the gift of reading, she helped boost her confidence to a whole new level!" Alisa Bernstein is one of the most talented and insightful speech language pathologists that I have ever had the pleasure of working with. Her thoughtful and kind manner coupled with her enthusiastic and supportive nature combine with her vast knowledge of the speech and language field resulting in outstanding clinical services for clients of all ages. I recommend her without hesitation. Alisa Bernstein worked with my elderly mother, who had aphasia caused by a stroke. She valued the time Alisa spent with her. Alisa is a dedicated and skilled therapist. I am most impressed by her compassionate, pragmatic and joyful approach. I recommend her without hesitation. 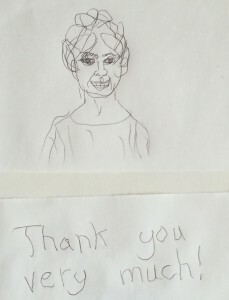 Thank you letter and drawing from a patient.